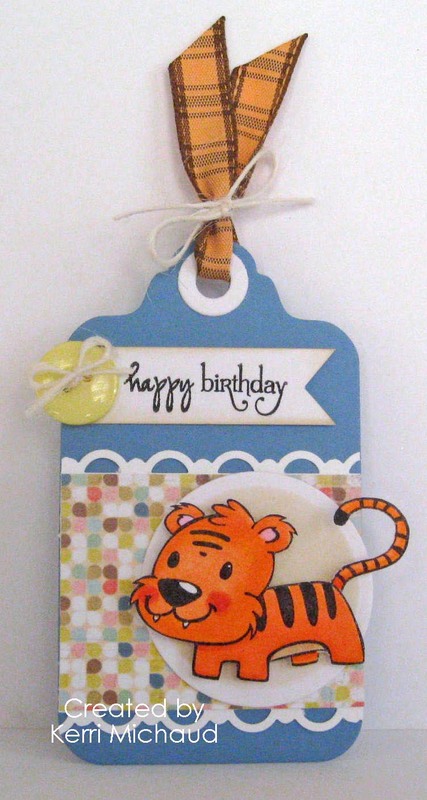 For my tag, I used this adorable little tiger from the Jungle Jesters Collection called Timothy the Tiger. The cardstock, dp, button, and ribbon all come from the PaperCard Kit! I also used a sentiment from the Verve set Big Wish, and the tag was cut with a PTI Tag Die. That's it for me today. Thank you so much for stopping by and I hope you have a wonderful Thursday! AWW how cute is that little tiger Kerri!! Absolutely ADORABLE!! What a fun tag gf!! Hope you have a great one! Too, too cute! Glad you're having great weather...thought you might be in Daytona already! It's to go up to 70 in VA tomorrow and that will feel like FL to me! Gosh, I adore your tags! I hear you about the humidity--it's bad here in East TN. Last summer was so hot and humid that we couldn't even stay at the pool for longer than 2 hours. What a sweet tag Kerri, so adorable! How cute is this! Really like this tiger! Just adorable!! Yep, we are having the most perfect weather. The kids and I have had a picnic outside for lunch almost every day this week. I'm loving it. I was just thinking how in maybe just a few weeks it's going to be too HOT to think about being outside. Gotta enjoy it NOW!! Super duper cute! Tigers are my fave! Love the darker red/pink on his cheeks...so dang cute!